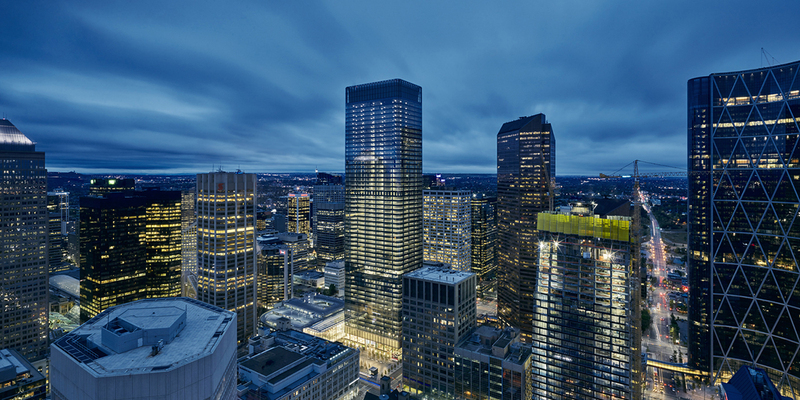 Brookfield Place Calgary stands at 56 storeys tall. As structural engineering and building envelope consultants on the project, we were thrilled with the challenge of helping design and bring this distinctive building to life. 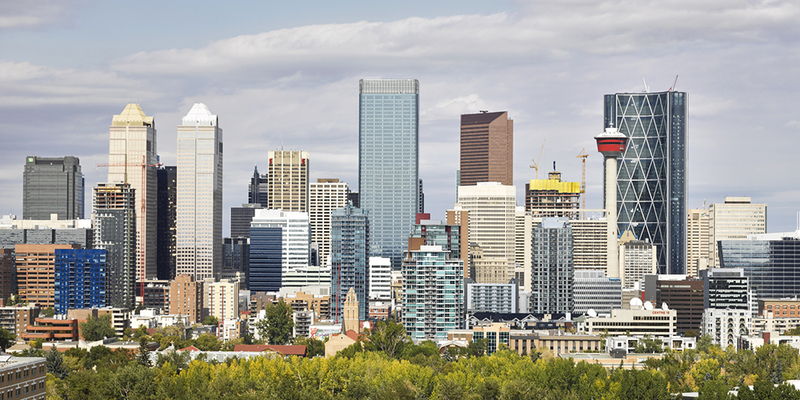 Here, we explore some of the most complex, interesting, and unique engineering facts you may not have known about Brookfield Place Calgary. 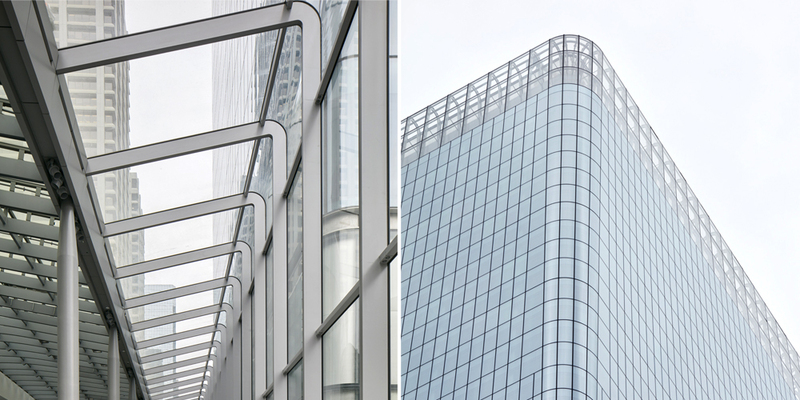 Unlike most buildings with curved corners, sections of the Brookfield Place Calgary glass are curved in two directions. The glazing is curved in one direction around each corner of the building, and at the perimeter of the top level the glass curves up and overtop the crown. This means that there are a few pieces of glass that are quite special – curved in two directions at once! This takes a complex bending process to create. Double-curved glass has been used in projects in Europe, Asia, and elsewhere, but this type of glazing shape is a first for Calgary. Crews demolished sections of underground parking nearby to accommodate the tower’s footprint and five-storey basement, a hole that took five months to excavate. In addition to a central reinforced concrete core, it took 10,000 tonnes (20,000 pieces) of steel, 85,000 bolts and a total of 120 human years of effort, to fabricate and erect the steel. 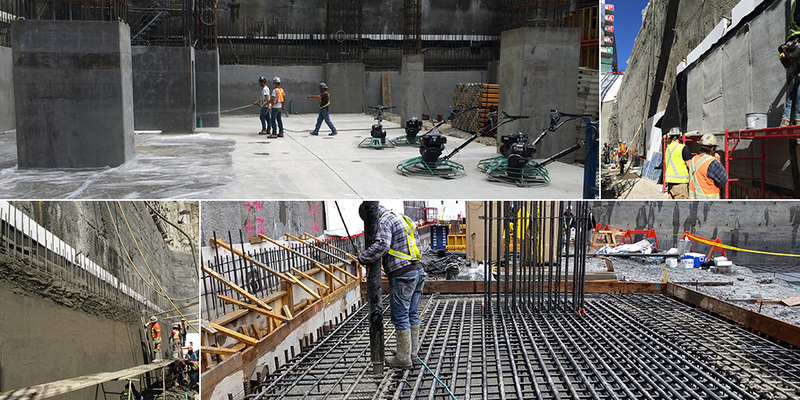 A bentonite sheet waterproofing system was installed against the caisson wall prior to shotcrete being installed for each parkade wall section. 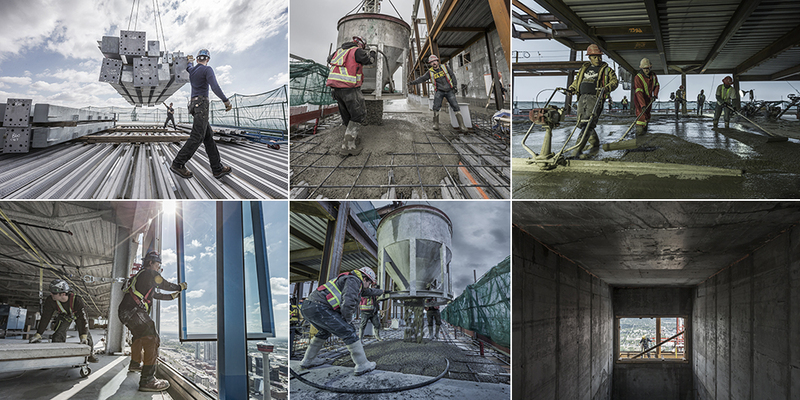 While most parkades integrate a single layer of waterproofing, the Brookfield Place Calgary parkade utilizes two layers of bentonite installed with seams offset to maximize performance. Should groundwater come into contact with these materials, the bentonite clay expands to minimize the ability for moisture to contact the concrete foundation elements. Lateral wind and seismic loads applied to the building are resisted by the central reinforced concrete core/elevator and stair shafts. With an aspect ratio of about 15:1, the lateral system is very slender for a building of this type. A concrete testing program was undertaken early in the project in an effort to design a concrete mix which would result in a stiffer concrete core overall, allowing for a reduction in the wall thicknesses. Unfortunately, the availability of local aggregates and other materials, as well as the high cost of importing materials proved to be cost prohibitive and a more conventional high strength concrete (80 MPa or 11,600 psi) was ultimately used. 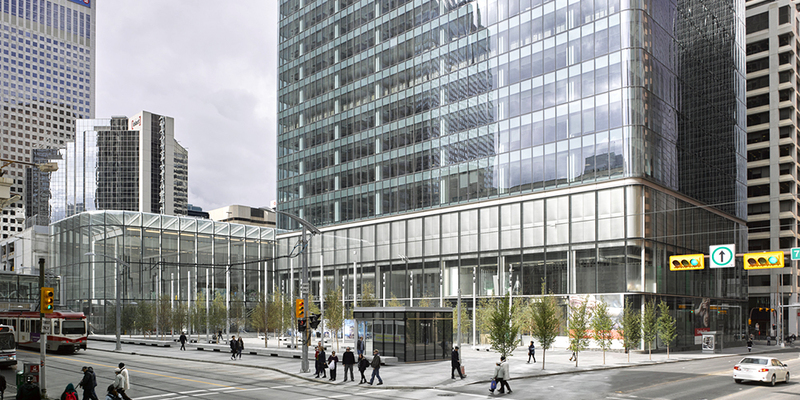 Calgary’s elevated pedestrian walkway system, Skywalk, is integrated into Brookfield Place Calgary’s design. The development connects with neighbouring buildings via Calgary’s +15 pedestrian walkway. The path connects the tower to the surrounding buildings as well as the Calgary Light Rail Transit system. Partially built, the Winter Garden Pavilion is a jewel box-like structure consisting of glass walls and roof softened by rounded corners and edges. Mullion sections measuring 325 mm x 75 mm (13 inches by 3 inches) will support the pavilion’s glass envelope. Similar to the tower, the shape of the pavilion includes curved corners and double-curved units at outer top-level corners. Managing snow and ice on the roof was one of the key design considerations, and we had to get creative. The roof drains run down the inside of the concrete filled columns, so there are no exposed drains in the pavilion. This took close coordination and detailed mock ups between all trades involved (structure, mechanical, electrical, and architectural finishes). The tower’s glazing consists of unitized curtain wall panels with a shadow box detail. The transparent glass extends all the way to the top of each panel, with a spandrel cavity shadow box installed behind the glass in the top section of the panel, rather than the more traditional aesthetic of an opaque spandrel area at the top of each panel physically separated from the vision area. A common issue with older shadow boxes is the potential for condensation/fogging within the insulated spandrel cavity. Since the glass is transparent in this area, we helped specify the need for drainage and ventilation of this space to ensure weep ports were provided in the Tower units to prevent moisture build-up in these areas from occurring. At lower Lobby levels, the shadow boxes are full height to hide mechanical floor equipment. These lower level shadow box areas are connected individually to a system which mechanically supplies dry air into the shadow box cavity behind the glass to prevent moisture build-up. The tower adheres to strict building efficiency guidelines, including optimization of energy, light and water, and the use of local and recycled building materials. The building uses innovative design technologies and conservation strategies. Incorporated in the building’s design, these features help conserve energy and limit its carbon footprint.